Sometimes, an idea seems to make so much sense that you can’t really say anything other than yes, that makes so much sense. 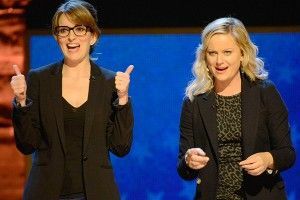 For example: NBC announced yesterday that power duo Tina Fey and Amy Poehler, the twin rocks of its Thursday-night comedy lineup, will host the network’s broadcast of this January’s Golden Globes. The two crushed it together for two years on “Weekend Update,” then got back together in 2008 to crush it in Baby Mama. Now they’re both crushing it independently, on 30 Rock and Parks and Recreation, while getting back together on various award-show stages to crush it from time to time. Or, in the perfectly stilted words of the executive producers of the Globes: “It’s exciting to have two of the most respected names in comedy. Amy and Tina’s well known chemistry along with their spontaneity and glamour makes them a perfect fit for the Golden Globes.” Glamour! Spontaneity! Respect of the comedic community! Fey and Poehler will be following Ricky Gervais at the Globes podium, who wore out his welcome as host but did last a remarkable three years. Which reminds me: I might be getting ahead of myself, but is it too late to sit Seth MacFarlane and have Amy and Tina host the Oscars this year, too? Anyway, we leave you with an excitement-stoking scene from Baby Mama. “What is this?” “Water?” “It’s horrible!” January 2013 is going to be awesome! The Top 10 Songs … Played at Funerals!